Enter now for your chance to win a set of Sew Easy Quilting Templates, sponsored by H.A. Kidd and Company Limited! 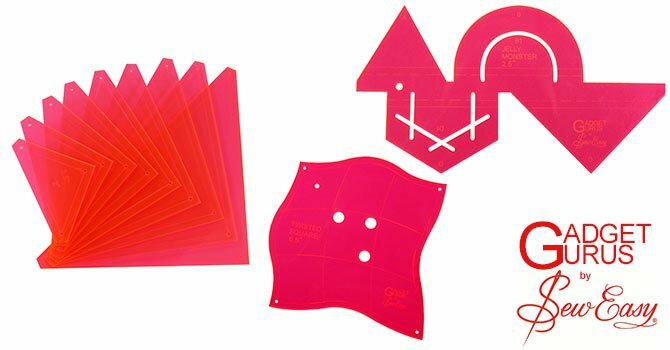 Sew Easy Quilting Templates come in all shapes and sizes and are made to help you explore your creativity. Create hundreds of designs for quilting; sewing; crafting; and scrapbooking. Contest ends Tuesday Sunday April 19th at 5PM. Get your entries in now! Congratulations to Diane E.M…winner of the QUILTsocial Weekly Giveaway for a Vintage Postcards Embroidery Album, sponsored by Husqvarna Viking. To enter this contest, log in below through Facebook or with your email, then follow the instructions. You’ll be required to comment on any one of our QUILTsocial blog posts, except this one. We do this to encourage you to explore the awesome content on our blog.